The Union government has decided to convene a tripartite meeting among the central and state governments and the Gorkha Janmukti Morcha in New Delhi on January 5 to discuss various provisions of the memorandum of agreement of the GTA. 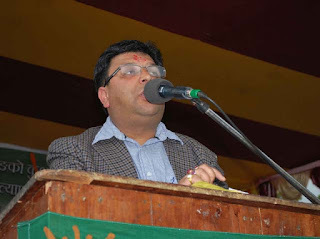 Roshan Giri, the general secretary of the Morcha, today said the party had received a letter from A. Jain, director, centre-state relations, ministry of home affairs, informing the organisation of the January 5 meeting which would be chaired by Shailesh, additional secretary (C-S), at the North Block in New Delhi. "We will be raising a number of issues at the meeting," said Giri. The officials of the GTA have also been invited to the meeting. Implementation of a three-tier panchayat system in the hills will be one of the issues the Morcha will raise at the talks. "According to our information, the Centre has agreed in principle to implement a three-tier panchayat system for the GTA area. They want us to suggest a name for the body," said Giri. Giri said the Morcha would also demand the transfer of 396 mouzas in the Terai and the Dooars to the GTA at the tripartite talks. Other issues like absorbing ad hoc employees into the GTA, transfer of reserve forests to the GTA, granting tribal status to hill communities, setting up a central university and complete transfer of departments will also be taken up at the talks.